Less well-known – but no less effective – is another of Peru’s visionary healing plants: San Pedro. Like ayahuasca, it has been drunk for thousands of years in shamanic healing ceremonies and through it there are said to have been a number of ‘miracle cures’ to a variety of illnesses, including cancer, diabetes and paralysis, as well as emotional and psychological problems such as depression and grief. 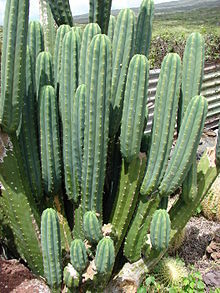 San Pedro is taken in the form of acold tea made by boiling sections of the tall mescaline cactus (Trichocereus pachanoi) which grows at high altitudes in the Andes of Peru. It’s more traditional name is huachuma but it hasother names too, most significantly “El Remedio”: The Remedy, which refers to its healing and visionary powers which, shamans say, enable us let go of “theillusions of the world”. Even the name San Pedro embodies thesequalities because the Biblical Saint Peter is the holder of the keys to Heavenand he – and the cactus – both open a gateway for us into a dimension where we can experience the world as divine. The earliest archaeological evidence forits use as a healing sacrament is a stone carving of a San Pedro shaman foundat the Jaguar Templein northern Peru,which is almost 3,500 years old and proves that, despite its name, however, SanPedro has been around longer than the Saint himself. Textiles from the same region and period depict the cactus with jaguars and hummingbirds, two of its guardian spirits, with stylised spirals representing the visionary experience. In contrast to ayahuasca, however, little has been written about San Pedro and no research has been conducted into its effects. We know that it was used to heal illnesses, to see the future through its prophetic and divinatory qualities, to overcome sorcery or saladera (an inexplicable run of‘bad luck’), to ensure success in one’s ventures and to rekindle love and enthusiasm for life. We also have an account from the ethnobotanist, Richard Evans Schultes, of how San Pedro works. That, however, is more-or-less it. I put this dearth of information to La Gringa, the female shaman or curanderaI now work with when I take groups to the Andesfor my Cactus of Vision programme to explore methods of Andean healing. “San Pedro is a master teacher”, she said. “It helps us heal, grow,learn and awaken, so we reach higher states of consciousness. I have been blessed to have experienced many miracles: people being cured of all sorts of illnesses just by drinking this plant. With new beliefs we can heal ourselves of anything since all illness, shamanically-speaking, arises from self-perception. Every disease we are prone to or condition we suffer from is, in this sense, at least partly psychosomatic: we create ill-health because of how we think and feel about ourselves and the world around us – which means we can un-create it too by“changing our minds” as a result of our San Pedro experiences. There is another sense though in which San Pedro gives us a new perspective on what is real. La Gringa offers anexample from when she was first working with the cactus and had an experience which “overturned everything I thoughtI knew”. In her visions, out in the mountains,a stairway of light appeared on a nearby hill. Assuming it was a hallucination– a trick of her mind – she called her shaman to help interpret its meaning. “You mean you see it too?” she asked. She thought he was crazy, of course.How can you photograph a vision, something just in your head? But she took thepicture anyway and when she later got it developed, there it was: the stairway of light, just as she’d seen it. She called her shaman again and he came over to look at the photo. The photograph she took that day is reproduced in my book, The Hummingbird’s Journey to God, which is the first to be written about San Pedro healing. There is something about the experience that lingers too. It is not just a momentary ‘drug trip’but an encounter with the divine and with ourselves that can change lives. These sound like spiritual or emotional changes, but San Pedro can also heal physical problems. One person La Gringa treated, for example, was a woman whose husband had died then, just three months later, her son was murdered. She was shattered. Her world fell apart and she had a stroke which paralysed her arm and led to the onset of diabetes. After ineffective treatments from doctors in South Africa,where she lived, she decided to try San Pedro. “I gave her the tiniest amount”, says La Gringa, “then she lay in my arms and cried her heart out for five hours. That is a good description for what happened actually, because, through the eyes of San Pedro, I saw strands of energy coming from her heart and circling her arm like a tourniquet. I began pulling them out and throwing them away. “The next morning there was a miracle. Her arm had regained all movement and, when she was tested, her diabetes had gone too. I asked her later about her San Pedro experience and she said she had felt a lot of pain in her heart, which is where I had seen the energy of grief that was binding her. So as well as curing her physical problems San Pedro showed her why she had them: because of the emotional distress she had been unable to let go of. Another example is David, a young man who moved to Peru after his divorce and then found lumps in his body. He “just sort ofknew” they were cancerous. He visited a specialist in one of Peru’s hospitals and a lump was removed for analysis. It turned out that it was, indeed, cancerous, and he was recommended for chemotherapy with the proviso that he should expect only limited success. “I had no money for treatment and, given the prognosis, there didn’t seem much point anyway. I resisted San Pedro as an alternative, though, because I didn’t believe in plants or spirits. “A friend of mine knew some shamans, however, and without telling me, arranged a healing for me at his house. I wasn’t there but they drank San Pedro and sent me prayers forgood health. I found out later that the energy was so strong at that ceremony that every electrical socket blew in the house when they sent their good wishesto me. The shaman said it was a sign that the energy causing my cancer had also unblocked and my tumours were gone. “The next day I visited the hospital to see how much chemo I was going to need. The consultant made more tests and said the results were strange: there was a ‘signature’ of cancer in my platelets but no lumps in my body anymore and so no need for treatment. “A few weeks later my friend confessed to the healing and I agreed to take part in another ceremony. Not long into it I experienced tremendous pain, like my heart was breaking in two. I stood up and started to vomit. “What I threw up I can only describe as unearthly. It looked like wafers of glass which were completely solid and transparent. I could pick them up and look through them. I asked the shaman what they were. “’They are the energy which was stuck inside you’”, he said. “’They have been blocking your heart for years so you could not love life and were inclined towards death. Now they are out and you are free of cancer’. I tried to stay sceptical but he was right. I have been well for the last nine years and was tested a year ago and I was totally clear. San Pedro, again, showed David why he had cancer and told him he had a choice: in blunt terms that he could die or change his mind. He decided not to be angry or have cancer anymore because he realised how precious life was when seen through San Pedro’s eyes. 1. Also see Positive Health issue 147,May 2008 for an article by Ross on ayahuasca: PlantMedicines and Shamanic Healing. 2. See, for example, the work of DrJacques Mabit, reported by BBC News at http://news.bbc.co.uk/2/hi/programmes/crossing_continents/3243277.stm. According to Mabit, “over a third of the patients that begin [ayahuasca] treatmentget completely cured… among those who complete the treatment, the successrate is as high as 70%”. Ross Heaven is the author of morethan 10 books on shamanism and healing, including Plant Spirit Shamanism and TheSin Eater’s Last Confessions. His latest, The Hummingbird’s Journey to God, thefirst to be written about San Pedro healing, is published by O Books. He also runsworkshops on these subjects, including journeys to Peruto work with the shamans, healers and plant spirit medicines (ayahuasca and SanPedro) of the Amazon and Andes. For more information,visit www.thefourgates.org or email ross@thefourgates.org. The potential of san pedro to rewire the way you think and literally transform yourself into quite simply whatever you want lies at the core of the plant. long live trochocerus pachanoi! San Pedro-a miracle healer? | Woman, interrupted.